Most of us are familiar with experiments involving petri dishes and the growth of microbes, often bacteria, in them. For over a century scientists have used circular glass petri dishes as growing environments for a variety of biological experiments. Usually many dishes are used to test a microbe's success to variations of environmental conditions. The finite and isolated petri dish allows quantitative comparisons between the environment differences of each dish. One general truth about microbes in a petri dish is that they will grow in number as long as the conditions are favorable. Those conditions include light, temperature, oxygen and the extent of the petri dish itself. 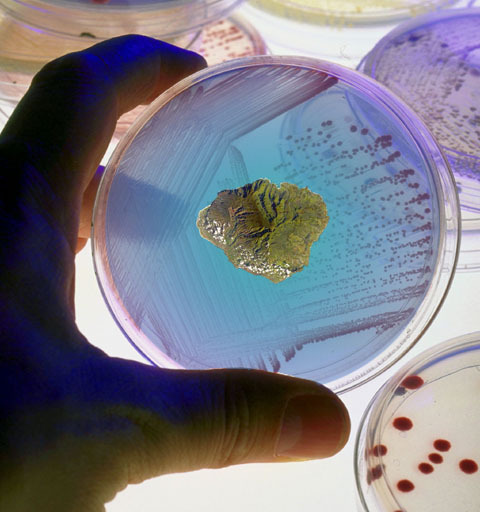 Microbes will continue to multiply even if they are running out of space. They will multiply even if they are poisoning their environment with waste products. They will grow until their population crashes against the limits of their dish. Then they die. Humans now face a similar situation. Our numbers and activity have turned the world into an experiment on human behavior. The question is, are we smarter than microbes? During our history as "civilized" human beings we have depended on the growth of population and the growing use of natural resources for our success. For much of our history there was always another continent of resources to move to and utilize. As it stands "growth" measured by the Gross National Product (GNP) is really the measure of the consumption of nonrenewable resources. Sustaining such growth even "smartly" requires a further spread of our unsustainable behavior in areas still un-destroyed by human activity. In fact, it is only a reduction of current levels of consumption that could attain sustainability. Observations indicate that current human population and the limits of our planet's resources are not in balance. To save ourselves, we have to change our need for growth as the measure of our success. This means changing our lives, and, to most of us, that means discomfort. We seem a patsy for any proposition that keeps us comfy... like the idea of "Smart Growth". "Smart Growth" argues that limited growth is sustainable. It is used as a case to extend the current way we do business. But "Smart Growth" is a red herring, a smarmy promise that makes us feel politically correct on our current road to oblivion. "Smart Growth" advocates argue that if we keep screwing up, but more slowly, things will be just fine. But, at best, if the promise "Smart Growth" were fulfilled, we would only delay the exhaustion of resources for another generation. To sustain humanity beyond our children and grandchildren, we must abandon our measure of success based on population and economic growth. Because we are now surpassing the limits of Earth's natural systems, we are very much in the same boat as the bacteria in a petri dish. Once the overcrowded organisms deplete the nutrients in the dish, they face a catastrophic crash of population, even extinction. To avoid that fate we must reach a balanced equilibrium between human needs and what remains of the rest of the world. Obviously, it would be greatly in our interest to formulate an economy that does not require growth of our population and increased consumption of finite nonrenewable resources. In a recent conversation with my son John, something he said clicked in ny head. During our talk he said that the measure of growth needs to merely be adjusted. The "Old Growth" model was the measure of the consumption of natural resources in their conversion to manufactured products. The "New Growth" model would be the measure of the increase in the amount and variety of living things by our activities. This was not just his idea, but somehow our discussion clarified the issue to me. It reminded me of an experiment that Charles Darwin conducted on the formation of topsoil. In the early 19th century it was not known how organic topsoil was formed. Many thought it was the work of God at the time of the Earth's creation. Darwin had suspicions of another means of formation – earthworm poop. Others argued that earthworms were not capable of the creation of so much organic material in the soil. In order to settle that issue Darwin cordoned off a measured section of an English meadow, dug up all the topsoil and then counted every worm in it. What he demonstrated was that the lowly worm was present in sufficient numbers to create and maintain all the topsoil in the meadow. Darwin showed that with some hard and careful work one can measure aspects of life and determine their value and source. What struck me was the possibility that with the right effort, wealth could be measured by the activities which enrich life, rather than devour it. Then the compensation for work could be reevaluated with the quality and quantity of all life in mind. This would be a new economic model. As mentioned in our first article, the theme for this column is the idea of "Ho'okahi Kauai"; the isolation, solitude and oneness of Kauai. We here on Kauai are living on a petri dish of sorts. It small and isolated enough to allow for a useful input-output model of life on our rock. Such a model would be a useful step to sustaining life here. There was a time 35 years ago, when I and another architectural student, Diane Lewis, made a proposal to Juliet Rice Wichman to literally do just that. At that time Juliet was just finishing her work on the Natural History Museum in Lihue. We had worked for her making some models and tried to convince her of the virtue of building a large working model of the island to monitor its conditions and be used as a planning tool. It would have filled a room of the museum. We described to her that back in 1970 we had seen an amazing model of the entire city of New York that was housed in one of the 1964 World's Fair exhibit halls. The model was vast and included every building in the city. Scaled architectural models of major building projects could be placed on the model to evaluate the impact on the city skyline. When I saw the model for the first time, the yet to be built World Trade Center towers were on the model. In any event, Juliet Rice Wichman didn't buy into our proposal for a model of Kauai. She was probably right, too. It might have made a nice display in the museum and provide educational opportunities, but it was not very practical for the deep and flexible analysis of planning on our island. Today computers can make a better model for managing resources. The real work horses in this area of computing are Geographical Information Systems. GIS allows for the overlay and relation all sorts of information gathered about our island. There is much already available: The state provides files of every road, every stream, every watershed, every dam, archeological site and more. This can be overlaid with property boundaries, zoning maps, land use maps, aerial photography, census data, infrared maps (indicating plant health and type), etc. With experience and skill, measurements can be made of such things as the percentage of unhealthy papaya trees within 500 feet of our major highway compared to papaya trees farther away. GIS is the tool of choice for timber managers, city planners, petroleum geologists, environmentalists and the military. GIS can be a God's Eye View of our island and the world at large. This tool may be the very thing we need to help model an economy based on something other than growth. A "steady state" economy that could only be achieved with careful measurement of the results of our activity. Delicate adjustments would then be possible to keep things in balance. There are vital issues of which we need a better grasp. How many acres of agland will Kauai need in the future to feed its own population and help support the dense population of Oahu? Can we afford to convert more agland to suburban residential use? GIS can help quantify and answer such questions. If you have high speed internet service, I highly recommend downloading the program Google Earth to get a sense of the GIS overview.